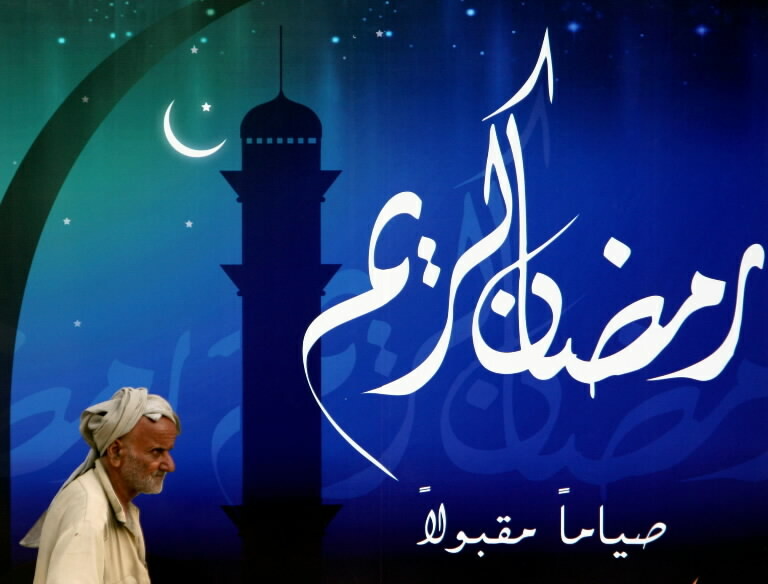 What is Ramadan all about? Is it only about abstaining from food and drink in the daylight hours? What is the key message for this Ramzan? Isn't respecting Huqooq-ul-Ibad (human rights of others) as important as observing Huqooq-ul-Allah (Duties to Allah such as prayer and fasting) for each Muslim? What must Muslims do this Ramzan to fulfill all of their obligations to Allah and His creation? What does the Economic Survey of Pakistan say about Pakistan's GDP, per capita income, infrastructure development, education and other important indicators? What must Pakistani leaders do to ensure greater focus on and investment in education and not just in infrastructure? What is the size of and the key priorities in Pakistan's budget for 2017-18? Should some of the $20 billion (out of the $50 billion budget) for infrastructure be allocated to education to boost Pakistan's stagnant literacy and school enrollment rates? Why is India losing IT jobs at a rate of 200,000 jobs a year, according to McKinsey? Is it all because of Trump's H1B visa tightening? Or does it have more to do with the need for new skills to deal with new technologies such as cloud computing and digital services? What was the objective of Trump's tour of the Middle East and Europe? Has he achieved any of the objectives? Was Nawaz Sharif's low-key presence at the Riyadh summit appropriate? Are Nawaz Sharif's critics right? Should he have had a more prominent role at the US-Arab-Islamic summit? How would that impact Iran-Pakistan ties? Upon closer examination of Barro-Lee data on "Educational Attainment for Total Population, 1950-2010", it is clear that Pakistani students stay in schools and colleges longer to graduate at higher rates than Indian students at all levels--primary, secondary and tertiary. While India's completion rate at all levels is a dismal 22.9%, the comparable completion rate in Pakistan is 45.7%. Sorry, I didn't give your reference in my comment. Ishmail: " This is from your previous blog"
It's for 15+ age group while the data in Economic Survey I referred to is for 10+ age group from 2016. For 10+ age group, the primary out-of-school children percentage is 42% (enrollment rate of 58%). Some children do enroll later after the age 10 and that decreases the rate of out-of-school children for 15+ age group. Pakistan literacy rate dropped to 58% last year from 60% the year before. Net Enrollment Rate dropped from 57% in 2014-15 to 54% in 2015-16. For five decades, Saudi Arabia has spread its narrow, puritanical and intolerant version of Islam — originally practiced almost nowhere else — across the Muslim world. Osama bin Laden was Saudi, as were 15 of the 19 9/11 terrorists. Looking at the sub-components of growth, there is good news from agriculture, which showed a positive growth of 3.5% versus actual contraction of 0.27% last year. This change may be attributed to a 3.02% growth in crops (cotton, sugarcane, maize and gram) against a negative growth of 4.97% last year. The government’s active attention to this sector through the Prime Minister’s Agriculture Kisan Package and increased disbursement of Rs700-billion credit may have helped the turnaround. However, the performance of industrial sector, with a growth of 5% against the target of 7.7% in 2016-17, is not very encouraging. Despite some bright spots such as those related to construction industry (iron and steel and cement), other key sectors such as fertilisers and engineering products were almost stagnant. Growth of services (5.98%) is mostly because of banking and insurance, which grew 10.77%. Similarly another sector, government services, showed a growth of 6.91%. While the growth in government services indicates increased expenditure and as such is not a healthy sign, the growth in the banking sector means higher deposit mobilisation, which is a positive indicator. There is slight improvement in government’s taxation policies towards telecom and mobile phone sector. This would, to some extent, balance the negative fallout of the anti-telecom policies followed over the last four years. Hopefully, this will once again make Pakistan an attractive market for foreign investors. According to the State Bank of Pakistan, in the last nine months, the FDI decreased $82 million. The government is finally realising that when its policies were favourable to this sector, it flourished and attracted FDI of approximately $5.7 billion (net). 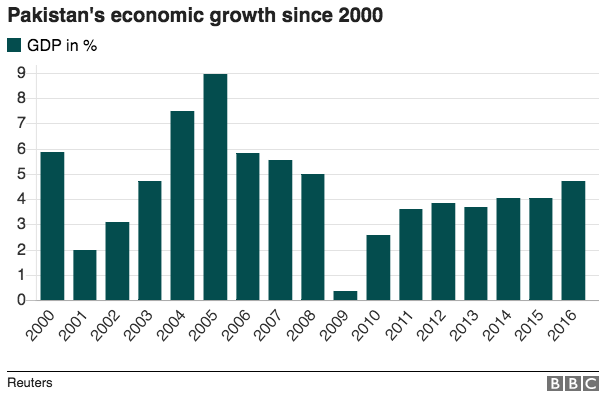 Furthermore, Pakistan’s high growth from 2003 to 2007 had a lot to do with liberalisation during that period. Total debt has risen to Rs20,872 billion compared to Rs14,318 billion in 2013. Thus, during the last four years, the debt has risen by almost 50%. Already this year, interest payment on debt was the largest single expense for the country. Next year Pakistan’s external debt servicing is estimated to be 25% higher than a year ago, which was $5.3 billion. It seems that increased spending on debt servicing will continue to be a major drag on the economic growth for years to come. Another worrying development is the continuous fall in exports since the PML-N government came to power. In the first nine months of the current year, there was a further decline of 3.06% with exports volume shrinking to $15.119 billion. The finance minister normally avoids speaking about exports as if this is irrelevant to the economy. What he has to realise is that this significant fall in exports has been one of the biggest failures of this government. There may be many reasons for this poor performance but the most obvious one is the anti-export bias in the tax policies. With every budget for the last four years, the finance ministry has been increasing taxes on international trade either to curb imports or raise higher revenue. These policies have isolated Pakistan from international markets with the result that the country’s exports have fallen. With the widening of fiscal deficit, slowing down of remittances and foreign direct investments and increasing circular debt, the government may find it difficult to keep the economy afloat without more borrowing. Furthermore, it is not likely that during the forthcoming election year, the government would maintain the ongoing reform process, which has been steady, even if slow. All these factors may result in the next government having to face serious economic challenges. I don't understand why you keep saying deficits and debts are manageable by international standards. For Pakistan it is too high and will lead to many problems. If you are growing at 6+ then I can understand. Farshid: "I don't understand why you keep saying deficits and debts are manageable by international standards. For Pakistan it is too high and will lead to many problems. If you are growing at 6+ then I can understand." Pakistan's total debt to gdp ratio is under 60% now. And external debt to gdp ratio is under 25%. I think it's manageable as long as it stays under these limits of 60% total debt (domestic+foreign) and 25% external debt to gdp ratios. It could only become a problem if the rate of debt growth exceeds the rate of gdp growth. The economy in India is growing faster than just about anywhere else. But there’s a threat to that expansion, one that the authorities are struggling to address: the mountain of bad debt at the nation’s banks. Those soured loans have contributed to a $191 billion pile of zombie debt that’s cast the future of some lenders in doubt and curbed investment by businesses. In the latest push for a solution, the central bank has been handed extra powers over lenders. 2. How’s this impacting the economy? Credit growth in Asia’s third-largest economy has dropped to a 25-year low. In other words, the quantity of new loans that over-leveraged businesses are willing to take and that under-provisioned banks are willing to give, is slowing. Investment by private companies actually started to shrink in the year through March and will, by the government’s estimate, contract by more than 7 percent this financial year. That’s threatening to derail Prime Minister Narendra Modi’s much-vaunted economic plans. 3. Why is India growing so fast then? It’s true, India’s gross domestic product is forecast to expand about 7 percent this year, the fastest rate among the world’s major economies. (Although some question the numbers.) Unlike in the U.S., where the pre-financial crisis boom was fueled by housing, India was plowing its money into productive assets such as power plants. That’s allowed the $2 trillion economy to prosper even as the banking sector got bogged down. Extra government spending has also cushioned the impact of that declining private investment. 4. How did the debt problem arise? Among the reasons for the surge in bad loans: a slump in commodity prices, a lack of appropriate legislation and regulation and a rapid buildup of excess capacity in industries such as telecoms and cement. Four industries account for nearly 80 percent of stressed assets: power, steel, textiles and engineering/procurement/construction. About 70 percent of the bad debt is held by state-owned lenders, the legacy of an investment spree that soured after the financial crisis. The government of Prime Minister Nawaz Sharif is likely increasing the country’s defense spending by 7% due to the growing need to safeguard China-Pakistan Economic Corridor (CPEC) projects and be better prepared to fend off any potential military threat from India. However, critics accuse the government of sugarcoating the budget ahead of the national elections. For fiscal 2017/18, Pakistan is setting its military budget at $9 billion, compared to $8.4 last year. By contrast, Pakistan’s biggest enemy India unveiled its own new budget in February with defense spending standing at more than $50 billion, according to the Institute for Defense Studies and Analyses. As much as $20 billion of the budget’s $50 billion will go toward development, $1.8 billion of which is set to finance CPEC projects. An op-ed published by DAWN suggests that there is a “Chinese footprint” on the Pakistani budget. As such, one can argue that the Chinese would allocate more money to CPEC projects if they were so keen on pushing forward the projects that matter to their national interests and not caring about Pakistan and its economic well-being whatsoever. One of the most prominent examples is Geo’s mud slinging for not increasing Pakistan’s health expenditures fourfold even though this year the government has increased health expenditures by nearly two times, from Rs. 29 billion to Rs. 49 billion. Should we double the education budget, or seek 100pc literacy? Pakistan has doubled its budget in recent years, but enrollment has stagnated. As a result of the inefficient use of funds, access to quality education for children across the country stands compromised. In recent years, the federal and provincial governments have undertaken numerous reforms with varying levels of success. Despite their efforts, a lot remains to be done to get kids into school and improve learning in the classrooms. To address these educational challenges, the efficient and effective use of the available budget for education is key. Provinces have allocated 17pc to 24pc of their budgets for education in 2016-17. (The provincial budgets for 2017-18 will be released in the coming weeks). The ‘current budget’ is for salaries and operational costs (non-salary), whereas the ‘development budget’ is for the construction and rehabilitation of schools. Recent history suggests that provinces tend to under spend on development and non-salary budgets, but overspend on salaries, so that they end up utilising most of the education budget. Unesco recommends that countries disburse 15pc to 20pc of their budgets on education. The global average is 14pc. Compared to its total national budget, Pakistan spends 13pc. In Pakistan's case, this spending amounts to 2.83pc of the GDP on education. According to Alif Ailaan, an additional Rs400 billion on education is needed this year to increase spending to 4pc of GDP, bringing the education budget to Rs1.2 trillion. Cutting a federal programme or collecting more taxes may help Pakistan towards that target. Cutting a federal programme or collecting more taxes may help Pakistan towards that target, but the dilemma of solving the education crisis will persist. While Pakistan has doubled its budget and brought it closer to military spending, enrollment rates have stagnated. Parents will send their kids to a private school, charging a few hundred rupees a month, if they can afford it. Nearly 40pc of students in Pakistan go to private schools. Their parents spend as much as the government does on education and tuition. If we add what Pakistani parents spend on education, Pakistan’s education spending exceeds 4pc of the GDP. Children are out of school in Pakistan because they get so little out of going to school. Teachers are either absent, or present, but not teaching. The 2015 report of the independent Annual Status of Education Report (ASER) finds that only 44pc of third graders in rural schools (public and private) can read a sentence in Urdu. Of those who stay in school through fifth grade, only 55pc can read a story in Urdu. It is a similar story for science at a grade four level. In 2006, 67pc of students scored below average in the National Education Assessment System (NEAS) assessment of fourth grade science. The situation further deteriorated in 2014, when the most recent iteration of the NEAS assessment divulged that 79pc of students had scored below average. The majority of children aged five to nine in Pakistan are in school. That’s 17 out of 22 million kids, according to the National Education Management System. Improving literacy and numeracy rates for them is our best shot at convincing the parents of Pakistan’s five million out-of-school children aged five to nine that school is worth it. Private school teachers are paid $25 to $50 per month. Government school teachers are paid $150 to $1,000 per month, according to a paper by SAHE and Alif Ailaan. Government school teachers have more education and training than private school teachers. In light of the difference in teachers' salaries, private schools spend less than half of what the government does per child. However, according to LEAPS, children who go to private schools are one and a half to two grades ahead of those in government schools, depending on the subject. On 2 May 2011, the Barack Obama announced that Al Qaeda leader Osama Bin Laden had been killed by US forces in Pakistan. He was shot dead at a compound near Islamabad, the Pakistani capital. And once again, Pakistan was in the headlines for all the wrong reasons. A country used to bad news - both politically and economically - it has long been seen as the basket-case economy of South Asia because of its slumping foreign reserves, weak currency and lack of foreign direct investment. It was probably one of the last places on earth that a foreign investor would think to put their money. But not Mattias Martinsson. Six months later, in October 2011, he launched Pakistan's first ever foreign equity fund. In the beginning he couldn't get anyone to back the fund, so he invested $1m (£780,000) of his own cash and that of his partners. Today, that fund is worth $100m. "It was a tough sell at the time," chuckles the soft-spoken Swede on the phone from Stockholm. That's an understatement. At one point - soon after the bin Laden killing - things got so bad that furious Pakistani investors stoned the exchange because of the falling share prices. "Then the US military bombed a Pakistani military base, and Pakistan initiated a blockade of the routes for Nato supplies. The market went down 10%," Mr Martinsson says. But he stayed in the stock market, and in 2012, things started to turn around with a tax amnesty the government launched encourage the Pakistani diaspora to repatriate money. "The market went up and we raised $50m in three months," he recalls. It also marked the first time in decades that more money was coming into Pakistan then going out. Almost a decade later, Mr Martinsson feels vindicated. That's because on 1 June 2017, Pakistan enters the MSCI Emerging Markets Index - a sign that things are turning around for the once-struggling economy. And investors are already starting to pour in. The MSCI Emerging Markets Index is made up of 23 high-growth economies including India, China and Brazil. If you had invested $100 into the KSE in January last year, it would now be worth $164. If you had put it into the MSCI, it would only be worth $137. That's a success that helped make the case for it to be included. Being in the Emerging Markets Index is a reputational reassurance to investors about the growth prospects and transparency of companies in that country. Pakistan used to be a part of the index, but was downgraded to frontier market because of the exchange's decision to shut down for four months in late 2008 after prices dropped dramatically. That meant foreign investors couldn't get their money out. "We were kicked out in 2008 after the financial crisis because of measures Pakistan took at the time to stop foreign funds from fleeing the country. Obviously foreign investors got a rude shock," says Nadeem Naqvi, the Karachi Stock Exchange's managing director. "We did a lot of lobbying and reforms to get re-included again into this index," he tells me from Karachi. And he assures me and investors, that the KSE will be a liquid market. "Parliament passed the Pakistan Stock Exchanges Act in 2012, which has improved corporate governance and reforms to prevent a reoccurrence of what happened in 2008," he says. Pakistan's gross domestic product (GDP) has also soared over the last few years, a lot of that is thanks to the growth in the middle classes, in part fuelled by the Chinese investment boom that is part of Beijing's One Belt One Road initiative. The re-entry into the emerging market block after nine years was made possible by the country’s improving liquidity and growth. Pakistan lost this position in late 2008, following a period of market turmoil that halted trading for months in the Karachi exchange. Pakistan is the first country to get the frontier-to-emerging promotion after Qatar and the United Arab Emirates several years ago. MSCI will add Pakistan to the Emerging Market Index effective May 31, at the market close, with a weight of just 0.2% (read: Can Emerging Market ETFs Retain Their Mojo in 2017?). The reclassification is making investors bullish about Global X MSCI Pakistan ETF (PAK – Free Report) – the ETF targeting Pakistani equity markets. The fund will likely lure a wider class of investors thereby injecting huge amounts of money into the country. In fact, the fund is on track for the biggest monthly inflow since its inception two years ago. The ETF has gathered $11.8 million in capital so far this month, propelling its asset base to $48.5 million. According to Bloomberg, the bearish bets have also fallen to the lowest level since December. Over $1 million short positions have been cut over the past six weeks. The product offers exposure to 43 Pakistani equities by tracking the MSCI All Pakistan Select 25/50 Index. The top two firms – Habib Bank and Lucky Cement – dominate the fund returns with a double-digit exposure each. Other firms hold less than 7.2% of the assets. From a sector look, financials and materials occupy the top two positions at 33% and 28%, respectively, followed by energy (18%). The ETF is expensive relative to many emerging market funds, charging 91 bps in fees and expenses. Additionally, it trades in small volumes of about 35,000 shares resulting in additional cost in the form of wide bid/ask spread. PAK has been outperforming the broad emerging funds, returning investors 33.5% over the past one-year period compared with gains of 29% for (EEM – Free Report) . It has a Zacks ETF Rank of 3 or ‘Hold rating with a Medium risk outlook, suggesting more room for upside (read: Pakistan ETF Hits New 52-Week High). The outperformance is likely to continue given the country’s GDP growth, falling poverty, and bourgeoning middle class. After falling to below 4% growth in 2008, Pakistan GDP growth hit a 10-year high of 5.28% for fiscal year 2016–17. However, terrorist attacks, bombings, other incidents of violence and brutal state retaliation continue to weigh on the country’s growth and the ETF performance. The Global X MSCI Pakistan ETF (NYSE:PAK) was unchanged in premarket trading Tuesday. Year-to-date, PAK has gained 7.49%, versus a 8.13% rise in the benchmark S&P 500 index during the same period. PAK currently has an ETF Daily News SMART Grade of A (Strong Buy), and is ranked #39 of 77 ETFs in the Emerging Markets Equities ETFs category. India has posted its slowest growth rate in two years, ceding its status as the world’s fastest-growing major economy to China, with economists blaming the downturn partly on last year’s shock decision to recall the country’s two highest-value bank notes. Analysts said the 6.1% GDP growth figure for the January to March quarter – compared with China’s 6.9% – reflected a general economic slowdown in the south Asian giant, compounded by the shock demonetisation of 500 and 1,000 rupee banknotes, worth approximately £6 and £12. The move led to months of acute cash shortages across India that hit the country’s manufacturing and construction sectors particularly hard, the former recording slower growth than in the same period last year. The construction sector contracted by 3.7%. The cash recall was intended to hasten the country’s transition towards a formal economy and close down the booming economy of untaxed cash transactions, which aid corruption, the funding of terrorist groups and keeps counterfeit notes in circulation. It was also expected to unearth stashes of untaxed wealth in a country where just 1% pay income tax. India’s Reserve Bank is yet to say how much “black money” was deposited in banks but early indications suggest it was less than expected. Gurchuran Das, an economic commentator, said the lagging growth was well below the rate India required to create enough jobs to match the number of new entrants to the workforce, estimated to be roughly 1 million people a month. “It shows that demonetisation was a big mistake,” he said. “What this has done is put us back about six months. We should have been inching towards 8% annual growth, but have ended up around 7.1%. He said the economy had bounced back after cash shortages eased in January and the country was likely reach 8% growth in the next three to four years, a prediction shared by the global ratings agency Moody’s. Arvind Subramanian, India’s chief economist, said the reduction in growth was “quite expected” after demonetisation, and that the replenishment of cash stocks and the monsoon period would help the economy rebound. Growth in India has been slowing since the middle of 2016, according to HSBC, but Das said the country’s economy was generally wellmanaged. “The inflation rate is the lowest it’s been in five years, the fiscal deficit has come down, and India has in fact become the largest destination for foreign investment in the world,” the former CEO of Procter & Gamble India said. He added that the key to creating high-productivity jobs in the formal sector was expanding India’s share of global exports, currently around 1.7%. India is preparing to introduce a national goods and services tax in July that is expected to make the country a more attractive destination for foreign investment, cut red tape for business and increase trade between states. But Moody’s has warned the country needs to further reduce debt levels if it hopes to boost its international credit rating, currently just above junk status. Although the implementation of demonetisation was seen as botched by some, the policy is thought to have been a political coup for the Indian prime minister, Narendra Modi. In March, he decisively won an election in India’s largest state that was seen as a referendum on the scheme. Stocks in Pakistan, now an emerging market, faced pressure this week. Debt-fueled growth and an election are among the risks to watch. Pakistan officially became an emerging market June 1 with MSCI's index re-categorization from frontier status, and yet the Pakistan ETF was this week's big loser among developing market funds. Moving to a bigger class of equities should draw more investors to the underlying equities in the index. Pakistan's financial health is tethered positively to China's grand investment in infrastructure, but also to political whims motivated 2018 elections. Still, the government is likely to do what it should to prop up the economy and currency. Yet this week, investors were selling on the news, and the Global X MSCI Pakistan exchange-traded fund (PAK) slipped 9%, making it the biggest loser among the developing-market funds we watch. The iShares Frontier Markets ETF (FM) slipped nearly 1% last week, and the iShares MSCI Emerging Markets ETF (EEM) was flat. So what gives? The MSCI's reclassification deliberations were well known, and the Pakistan ETF is up about 18% over 12 months. That's not an outrageous return, with the iShares Frontier ETF up 14% over the past year, and the iShares Emerging Markets ETF is up 25% in that time frame. Direct bank borrowing to fund the deficit is expected to be halved from $7.06 billion last year to $3.7 billion. This will likely be offset by an increase in marketable debt issuance (local and foreign). While this will help develop Pakistan’s bond markets, it will fuel upward pressure on yields, raise the interest expense in subsequent years, and drain reserves to service the debt." "Indo-Pakistani relations remain tense after the recent outbreak of killings in disputed Kashmir. Yet this is nothing new in a conflict that has been going on since independence was established for these two countries in 1946. Unfortunately, we have come to expect periodic outbreaks of violence in Kashmir." LAHORE – Punjab Finance Minister Dr Ayesha Ghous Pasha on Friday presented fifth provincial budget Pakistan Muslim League-Nawaz (PML-N) for upcoming fiscal year 2017-18 with total outlay of Rs1.977 billion. The budget session was presided over by Punjab Assembly Speaker Rana Muhammad Iqbal Khan, and also attended by Chief Minister Mian Muhammad Shehbaz Sharif. The provincial minister said that the budget for the next fiscal year has the largest development programme amounting to Rs635 billion. She added that it was unprecedented in the country’s history among all provinces. “The development budget is 15 per cent more than the current fiscal year,” Dr Ayesha said in her budget speech. Earlier, the provincial cabinet approved the budget in a meeting presided over by CM Shehbaz Sharif. The government has allocated 20 billion for agriculture in the province. Rs635 billion allocated for annual development program. Rs 95 billion for roads. Rs57 billion have been allocated for Water and sanitation. A total of 341 billion have been allocated for education in Punjab. Rs57 billion have been fixed for health sector. Rs 20 billion have been fixed for DHQs, THQs. Primary healthcare will get a Rs1 billion boost in the next fiscal year. An amount of Rs 20.4126 billion has been allocated in the fiscal year 2017-18 for the provision of free medicines. A 10 per cent raise has been made in the salaries and pension of provincial government employees. Rs52.35 billion will be allocated for school education. A sum of Rs230 billion has been set aside for District Education Authorities. Rs28 billion have been fixed for providing basic facilities at government schools. Rs6.03 billion have been set aside for construction of new classrooms in Punjab schools. A sum of Rs7.567 billion has been allocated for industries in the proposed budget. TEVTA will receive about Rs5.054 billion as grant-in-aid, and an amount of Rs145.575 million has been reserved for Headquarters Establishment. An amount of Rs179.354 million has been reserved for Inspectorate of Mines, whereas the Punjab Small Industries Corporation will get Rs1.420 billion as grant-in-aid. Punjab Skills Development Project will receive Rs43.354 million. Sasti Roti Authority will receive Rs8.799 million and Rs180.397 million will be spent on the regional establishment. "O People! Whoever among you improves his conduct during this month will have a safe passage on the right path when many feet will slip away, and whoever among you decreases the burdens on his servant, will be rewarded by Almighty Allah decreasing his reckoning. Last month, after over two decades in India, Detroit giant General Motors (GM) called it quits. The company will stop selling cars in India and focus only on exports from its factory in Talegaon in Pune. GM will shut down its plant in Halol in Gujarat. It has been struggling in India, selling 25,823 cars in 2016-17, giving it a market share of under 1%. Its dealers and customers are still reeling under the shock. In a market that at last count had over 17 carmakers, and in which the top four control over 75%, a legitimate question to ask is: who next after GM? It’s also pertinent considering that all is not well at many of the bit players — in India as well as at the global headquarters. Look under the hood at Volkswagen India. It has been hit by a flight of senior honchos at the sales division. The head of sales, national head of corporate sales and south sales manager have reportedly quit. More exits are said to be in the offing. The world’s largest carmaker that sold over 10 million cars as a group in 2016 is struggling in India. Under the mother VW brand, the Indian outpost sold 50,042 cars in 2016-17, yielding 1.6% in market share. “India is indeed one of the toughest markets,” says Andreas Lauermann, managing director, Volkswagen India. But he has reason not to give up. “If you can crack it, you can practically access many more such markets around the world. We know that the I ..
Indian factory growth cooled in May as new orders expanded at a more modest pace, but manufacturers were able to raise prices slightly, according to a private survey. The Nikkei Manufacturing Purchasing Managers’ Index, compiled by IHS Markit, fell to 51.6 in May from April’s 52.5, marking its fifth month above the 50 level that separates growth from contraction. Output expanded at the softest pace since February but remained moderate. The new orders sub-index, which reflects both domestic and foreign demand, fell to 52.6 from 53.8 in April. Export orders contracted for the first time in four months, albeit marignally. “The upturn in the Indian manufacturing sector took a step back in May, with softer demand causing slower expansions in output and the amount of new work received by firms,” said Pollyanna de Lima, economist at IHS Markit. While companies were able to raise selling prices, the increase was modest, reinforcing views that inflation may remain below the Reserve Bank of India’s medium-term target of 4 percent, giving it room to ease monetary policy. Indian inflation eased in April to 2.99 percent from 3.89 percent in March. Also helping the inflation outlook, monsoon rains have arrived earlier than anticipated, with the meteorological department predicting normal downpours this year. “With inflation under control and manufacturing growth below par, we may see the RBI changing neutral monetary policy stance to accommodative in coming months in order to support the economy,” de Lima said. While the central bank is expected to leave rates unchanged at 6.25 percent in its June meeting, the Monetary Policy Committee will adopt a less hawkish tone in its statement, according to a Reuters poll of 60 economists. Analysts think that a policy hold is still on the cards, despite a shock slowdown in economic growth reported on Wednesday. The economy expanded 6.1 percent in the January-March period, far slower than expectations for 7.1 percent, with capital investment showing no sign of reviving. However, consumer spending is likely to pick up before the government implements a multi-rate Goods and Services Tax from July 1, with some items expected to be taxed at 28 percent or higher. Saudi Arabia, Bahrain, the United Arab Emirates have broken diplomatic relations with Qatar, rattling a powerful 36-year-old Gulf states union, over what they say is the country's support of terrorism. Egypt has also cut off relations with the tiny Gulf state. A statement on Saudi Arabia's state news agency announced the move Monday morning, in order to "protect national security from the dangers of terrorism and extremism." All ports of entry between the two countries would be closed, according to the statement. Late last month, Saudi Arabia, the UAE, Bahrain and Egypt blocked several Qatari media outlets, including state-funded Al Jazeera, over comments allegedly made by Qatari Emir Sheikh Tamim Al Hamad Al Thani. Al Thani reportedly hailed Iran as an "Islamic power" and criticized US President Donald Trump's policy towards Tehran. The Emir's comments appeared on Qatar's official news agency, but Qatar claimed that the website was "hacked," the report fabricated by the culprits. Saudi Arabia and Iran are at odds over a number of regional issues, including Iran's nuclear program and what Saudis see as Tehran's growing influence in the kingdom's sphere of influence -- especially in Syria, Lebanon and neighboring Yemen. The events transpired just days after Trump visited the Saudi capital and addressed 55 Muslim leaders in a landmark speech urging them to double down on efforts to combat terrorism. Oman remains the only GCC member to maintain ties with Qatar. ISLAMABAD: Pakistan’s per capita income rose 6.4 percent to $1,629 in the current fiscal year of 2016/17 from $1,531 in the preceding fiscal year, an official document revealed on Thursday. The per capita income grew 2.9 percent in 2015/16 over the preceding fiscal year. The ministry of finance will release the figure of per capita income along with the upcoming Economic Survey (2016-17) before the announcement of the budget for fiscal 2017-18. The survey is expected to be released on May 25, 2017 by the finance minister Ishaq Dar. The per capita income has been calculated on the basis of projected population of 197.3 million for the current fiscal year of 2016-17 compared to the population size of 193.6 million in the previous year. The document showed that the savings to GDP ratio has fallen to 13.1 percent of GDP in the fiscal 2016-17 against 14.3 percent of GDP during the previous year. However, the most worrisome aspect of the economy is a declining trend in private investment during the current financial year. The document showed that investment to GDP ratio inched up in the outgoing fiscal year despite significant investment inflows from neighbouring China under the $57-billion China-Pakistan Economic Corridor (CPEC). “At a time when the country is claiming for receiving billions of dollars in shape of CPEC but total investment in GDP term went up from 15.6 percent in 2015-16 to just 15.8 percent for the current fiscal year,” an official said. In absolute numbers, total investment stood at Rs 5,026 billion in 2016-17 against Rs 4,526.7 billion in the last fiscal year of 2015-16. The country received $1.733 billion in foreign direct investment (FDI) during first 10 months of the current fiscal year of 2016/17, up 12.7 percent from a year earlier, as investment from Chinese companies continued to increase. The State Bank of Pakistan said most of the new investments, in the July-April FY17, went into food processing, electronics and construction sectors. FDI from the Chinese companies rose 13 percent to $718.3 million in July-April FY17. The government document showed that the fixed investment in GDP ratio increased to 14.2 percent during the ongoing fiscal year against 14 percent in the last fiscal year. The public investment in GDP terms also rose 4.3 percent in 2016-17 compared to 3.8 percent for the last financial year. However, the private investment in GDP terms declined 9.9 percent in 2016-17 from 10.2 percent during the previous fiscal year. Similarly, the national savings in percentage of GDP has declined from 14.3 percent in 2015-16 to 13.1 percent in the ongoing financial year, registering negative growth. In absolute figures, the national savings stood at Rs 4,161 billion in 2016-17 against Rs 4,173 billion in fiscal 2015-16. Pakistan is content to sit back and watch. There are no plans to follow in the footsteps of Saudi vassals like Yemen and the Maldives and cut ties with Qatar, according to the Foreign Ministry. That unnamed government official mentioned earlier said much the same in more diplomatic language. You could almost hear him smile. With the Arabs lashing out at each other—a family feud on steroids—nuclear-armed Pakistan is happy to back away from the coming fight with Iran. ISLAMABAD—The wheels are already coming off Donald Trump’s grand Muslim anti-terror coalition and there is a quiet sigh of relief here in the Pakistani capital. It’s nice when a solution to global conflict fits in 140 characters. Now the thin veneer of unity has been torn asunder with the announcement that Saudi Arabia and its Gulf allies are severing diplomatic relations with neighbor Qatar, a card-carrying member of the putative anti-terror coalition, and cutting off all land, air and sea ties. “This decisive decision” was being taken because of “grave violations” including “adopting various terrorist and sectarian groups” including “the Muslim Brotherhood Group, Daesh (ISIS) and al Qaeda,” the Saudis said in their declaration, without betraying a hint of irony. Who knew politics in the Greater Middle East were so complicated? The Riyadh summit “has widened the sectarian divide in the Muslim world,” the nation’s leading newspaper, Dawn, declared over the weekend as the latest Saudi-Qatari tiff was about to transform into an all-out diplomatic and economic assault. In a blur of glittering chandeliers, glowing orbs, and billions of dollars in trade deals (along with a tidy gift to Ivanka Trump’s favorite charity), Saudi Arabia had deftly transformed itself into America’s soul-mate and Iran secured its place as Public Enemy #1. All that complex stuff about the so-called Islamic State being a Sunni terror group that gains its inspiration—and financing—from elements in Saudi Arabia and the Gulf states, while Iran is Shiite and at war with ISIS, was left at the palace door. Ditto the fact that America’s bare-chested, muscle-flexing entry into the Middle East’s seminal religious and geographic divide left Pakistan—a Sunni-majority country with a sizable Shiite population —in a no-win situation. After all, while Saudi Arabia provides billions in aid to Muslim Pakistan, Iran is right next door. Iran’s foreign minister on Thursday derided as “repugnant” a statement from President Trump that linked twin attacks in Tehran to what he called Iran’s support for terrorism. Meanwhile, Iran’s Intelligence Ministry identified five of the attackers — all killed during Wednesday’s bloodshed — as Iranians who had left the country to join the Islamic State militant group in Iraq and Syria. The ministry published photos of their bodies. A sixth attacker was arrested, officials said. At least 17 people were killed at Iran’s parliament in Tehran and at the sprawling mausoleum complex for Ayatollah Ruhollah Khomeini, the leader of Iran’s Islamic revolution. The State Department and White House joined other nations with statements condemning the attacks. But Iran’s foreign minister, Mohammad Javad Zarif, fired back at the White House and the U.S. Senate. Zarif, who is on a visit to Turkey, tweeted criticism of a vote by the Senate soon after the attack to extend sanctions on Iran. “Iranian people reject such U.S. claims of friendship,” he said, hinting in the tweet that the terrorist attacks were “backed by U.S. clients” — an apparent reference to Iran’s regional rival, Saudi Arabia. In a White House statement, Trump expressed grief for the victims but concluded by saying that “states that sponsor terrorism risk falling victim to the evil they promote.” Other countries such as Russia, Britain and France just expressed condolences for the attack. The Trump administration has taken a much harder line toward Iran than its predecessor, describing the country as the top state sponsor of terrorism in the world and backing the view of allies Israel and Saudi Arabia that Iran is the chief threat to stability in the region. The attacks were claimed by the Islamic State — an avowed enemy of the United States and Iran. The United States and Iranian-backed fighters are battling the Islamic State in neighboring Iraq and Syria. Iranians awoke Thursday to find increased security on the streets of the capital and an announcement that the death toll from the attack had risen by five to 17, according to the coroner’s office. Emergency medical services said 52 were injured, with 31 people still in the hospital. Iran’s police chief, Brig. Gen. Hossein Ashtari, said Thursday that one of the attackers was in custody and being interrogated. According to the Interior Ministry, four people attacked the parliament building Wednesday with automatic weapons. One attacker detonated an explosive vest, and the others eventually were gunned down by security. The men entered the building disguised as women, who in Iran often wear billowing robes that would have allowed them to conceal weapons. A two-person team, including one woman, launched a nearly simultaneous attack at Khomeini’s enormous tomb complex in the south of the city. The woman blew herself up with an explosive vest, according to the ministry statement. Both sites are revered symbols for Iran. The tomb commemorates the founder of Iran’s 1979 Islamic revolution, and the Majlis, or parliament, represents what the country describes as its participatory government — in contrast with the hereditary monarchies of its main regional rivals across the Persian Gulf. The attack appeared to be inflaming the enmity between Iran and the Arab gulf states. Madeshwaran Subramani is the human face of IT disruption in India. He recalls being recently summoned to the HR office of his employer in southern city of Coimbatore at 11 a.m. By noon, the 29-year-old software engineer was out of a job. He worked for Cognizant Technology, a U.S.-based firm with offices in India. "They give only two options," explained Subramani: Leave immediately and take four months' pay, or stick around another 60 days and leave with two months' salary. Subramani, who has a mortgage and a child, says he was given one hour to choose. He'd been with Cognizant since graduating from college. "Nearly eight years' experience [as an] associate," Subramani says wistfully. "Within one hour everything is over." He walked out and, days later, was ferrying customers in his car, which he turned into a taxi. India is capping unprecedented success and expansion in its IT sector with something equally unprecedented: layoffs. For decades India's IT talent has maintained the world's computers, databases and back offices. But new technologies are overtaking that old business model, and India's tech giants are scrambling to keep pace. For 20 years, the nation's lucrative business model revolved around the idea that you can move work to low-cost locations, such as India. But cheap outsourced labor that performs routine tasks is being eclipsed, says Peter Bendor-Samuel, CEO of the Dallas-based research consulting firm Everest Group. He says the demand now is for disruptive technologies, "like artificial intelligence, cloud [computing], big data analytics, ... robotic process automation." These technologies require highly advanced skills, and to be competitive, India's IT firms will have to either replace or reskill their workers. But, Bendor-Samuel says, "a significant proportion, perhaps as much as half, will struggle with their training." Bendor-Samuel says 20,000 employees in India's 4-million-strong IT sector lost their jobs this year, and he predicts that will accelerate to hundreds of thousands of layoffs over the next few years. "These companies don't only face the issue of retraining people, they face a fundamentally different change in their business model — how they make money — and it's going to cause them a lot of pain," he says. India's tech industry isn't the only one affected, says Phil Fersht, CEO of the research and analysis firm HfS in Cambridge, England. "This is a global problem where there's less need for routine transactional employees, he says. "And unfortunately for India their IT industry is caught up in this inflection point and this [long-term] shift." But R. Chandrashekhar, president of India's National Association of Software and Services Companies, says it's not as if all the jobs that were previously there "have suddenly gone out of fashion." "That's certainly not the case. These are shifts that are taking place and they are taking place incrementally," Chandrashekhar says. Tech firms are "aggressively" retraining staff, he says. ith more than 20 million children out of school, Pakistan has, at last, begun talking about its education crises. Our media and civil society routinely grill politicians on a lack of funding for public schools. Opinion sections of national newspapers usually publish a few articles a week on how the lack of quality education is becoming an existential threat to Pakistan’s social cohesion. Foreign aid funded projects take primetime television ads to tell parents about the importance of educating their children. It has had some impact; education has become a key talking point in political debates. The government regularly boasts about the growing education budget with promises to provide an “excellent environment” to students. But what is lacking in this increasingly noisy debate on Pakistan’s education crisis is the experience of parents and students on the ground. The lack of nuanced policy is leading to an alarming trend. Education spending on the ground is being translated into schools as a means to provide jobs, rather than to provide children with a quality education. There is a very strong political element to this, as legislators are customarily elected on the basis of how many jobs they can provide to their constituents, and hence hiring new teachers takes priority in budget allocation, particularly when close to a general election. For the government, this preoccupation appears to kill two birds with one stone; an easy fix for the education crises, and sought after permanent government jobs for their constituents. As a consequence, education departments are typically the single largest employers in most provinces. Increasing the number of teachers across the country has also been an easy policy for everyone to get behind, especially since the public discourse on fixing the education crisis has largely been focused on the need to spend more on education. In 2016, Pakistani provinces spent between 17 to 28% of their budgets on education, while the global average was 14%. Combined that’s $7.5bn spent on public education nationally, with most provinces doubling their budgets within the past five years. But Pakistan can’t simply spend its way out of its education crisis. On the ground, most of the spending is being used for hiring non-performing teachers or providing salary hikes for existing teachers. A small section of the spending is set aside for new education infrastructure however about half of it, on average, goes unspent by provinces every year. In fact, the proportion of spending on much-needed education infrastructure has decreased, as salaries take a larger than ever proportion of the spending total. The problem is that this rapid rise in spending isn’t translating into education for all. School enrollment nationally has continued to stagnate. Even if enrollment drives are able to get students into schools, evidence shows that only one in four children who enroll in the first grade remains in school by the 10th grade. Even of those students who remain in school, most aren’t learning basic skills like literacy. Studies have shown that over half of all 3rd graders, children aged 9-10, in government schools are illiterate. For change to happen the quality of the conversation around Pakistan’s education crisis needs to improve. The people need to demand better teachers who are accountable to the communities they teach in, while donors need to rethink about their fixation with unrealistic funding targets and instead support reforms which make schools more efficient. On June 16th the IMF warned of re-emerging “vulnerabilities” in Pakistan’s economy. It praised GDP growth of above 5% a year, but noted missed fiscal targets and a ballooning current-account deficit. The fund’s own projections a year ago for the fiscal year ending this June underestimated this deficit by about half the final total of $9bn. And based on trends in early April it overestimated the fiscal-year-end foreign-exchange reserves by $3bn. Independent economists point out that, many times before, collapse has come on the heels of an IMF programme’s conclusion. Sakib Sherani, a former government economist, says that to avoid “egg on its face” for cheerleading Pakistan’s economic recovery just months ago, the IMF is slowly changing its story. By the end of 2018, many predict, Pakistan will come begging again. The fund responds that it is “too early to speculate”. Some of Pakistan’s faltering can be blamed on bad luck, such as a fall in remittances from workers in the Middle East. But mostly it was, as usual, bad policy. Like its predecessors, the PML-N has failed to enact the structural reforms needed to break Pakistan free of its cycle of crises. Barely any goals of the IMF’s programme were met. Bloated, underperforming or, in the case of Pakistan Steel Mills, closed-down publicly-owned enterprises drain millions from the government each month. “Circular” debt, caused by delayed payments along the electricity-generation chain, is swamping the energy sector once more. Annual exports have declined by 20% in dollar terms since 2013, stymied by an overvalued currency. All this means the government is again borrowing hand over fistfrom local and foreign banks. In some cases the design of the IMF programme itself has added to Pakistan’s woes: by pushing for increased tax revenue above all else, it has allowed the government to clobber the poor with indirect taxes, milk the (few) direct taxpayers even further, and, as ever, ignore the wealthy elites. The source of funds is changing even if government recklessness is not. China plans to invest $62bn in Pakistan for a range of projects, particularly power plants, around the 3,000km (1,875-mile) China Pakistan Economic Corridor (CPEC). That could lift Pakistan to more stable prosperity. But paying for the CPEC will not be easy. Unlike loans from the IMF or World Bank, some two-thirds of those taken out so far, for $28bn-worth of early projects, are on commercial terms, with interest high at around 7% a year. When these loans come due, argues Farooq Tirmizi, an emerging-markets analyst, Pakistan will need a bigger bail-out than ever before. The IMF has concerns about the lack of transparency surrounding Pakistan’s CPEC debts and how it will repay them. Any future fund lending to the country may include conditions that sow discord between the country and its new patron. And with President Donald Trump in charge of America’s foreign policy, there is no guarantee that the old one, America, will prove as generous—in the event of a crisis—as it has in the past. Pakistani rupee rebounds after shock plunge fastFT Read next fastFT Dollar takes a dip on US payrolls report 2 HOURS AGO Share on Twitter (opens new window) Share on Facebook (opens new window) Share on LinkedIn (opens new window) Save 2 HOURS AGO by: Mehreen Khan Pakistani’s rupee has recovered some poise after a shock plunge against the dollar that has escalated tensions between the government and central bank. The rupee nosedived more than 3 per cent on Tuesday to its lowest since at least 1989 – marking its first significant move in over two years. The central bank had been keeping the currency stable against the dollar for over three years with the surprise plunge immediately raising questions about the State Bank of Pakistan allowing the depreciation to help support the economy. Having weakened from Rs104.8 against the dollar to Rs108, the rupee is now trading around Rs105.8 but has still not managed to wipe out the week’s losses. Pakistan’s finance minister has since hit out at the central bank, accusing it of “exploiting” the country’s political troubles where prime minister Nawaz Sharif has been implicated in a corruption scandal over the Panama Papers. Ishaq Dar, finance minister, called the move in the currency “artificial”, and said he had “deep concern and indignation” at the central bank’s tactics. He has ordered a government investigation into the FX move. Pakistan has suffered from a drop in exports in recent years, as well as declining remittances from Pakistanis living overseas. Economists note that a weaker currency should help reverse both trends while also allowing the central bank to preserve its dwindling foreign currency reserves. The benchmark Karachi 100 stock exchange is up 1 per cent today after suffering a 4 per cent plunge on Tuesday.